Learning that his company will be sent back to the front, the weary Captain Paul LaRoche (Warner Baxter) says goodbye to his girlfriend Monique La Coste (June Lang). When the town is bombed by a zeppelin, Monique is rescued by the charming Lieutenant Michel Denet (Fredric March), who has just been transferred to LaRoche’s company. Replacements show up and LaRoche gives a welcome speech that explains the regiment’s glorious history, and his expectation that no man will damage the record. Denet initially believes that LaRoche wastes his men’s lives, but after repeated tours on the front, he comes to accept the need to take risks to save France. Meanwhile, LaRoche relies on aspirin and cognac to battle exhaustion and nerves, while giving the same welcome speech again and again to new groups of replacements. Denet and Monique fall in love, although he is unaware that she is the captain’s girlfriend. While giving his usual speech to yet another batch of replacements, Captain LaRoche notices his father, Private Morin (Lionel Barrymore), among the replacements and rejects him after a brief reunion. However, Private Morin bribes a drunken sergeant (Gregory Ratoff) to ignore the transfer order. Discovering Monique and Denet’s affair, LaRoche accepts a suicide mission. The lovers end up together, and Lieutenant Denet finds himself in command of the company, giving Captain LaRoche’s welcome speech, as the cycle of endless slaughter continues. 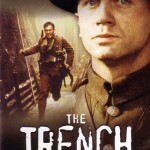 Set in France in 1916, the movie captures the exhaustion that had set in after two years of war. A soldier from the previous company is trapped in barbed wire in No Man’s Land, and the men are going nuts listening to him moaning in pain. Tired of losing men in futile rescue attempts, LaRoche puts the man out of his misery. However, some of the scenes are strange. While serving a tour on the front, the soldiers discover that the Germans are mining underneath them, but LaRoche insists that they stay, hoping that they won’t be there when the mine is detonated. Fortunately, the mine blows up shortly after they have been relieved. While the scenes of the company desperately hoping that the mine will not explode underneath them, are suitably tense, it does not make any sense. Wouldn’t they launch a countermine if they knew about mine? 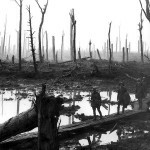 Why would they keep marching away from the front after the mine detonated? Wouldn’t they need to go back and defend that section of the line, since the Germans presumably would have attacked right after? Also, the Germans remained on the defensive on the Western Front for most of the war, aside from Verdun, and it is definitely not Verdun, because there would be never-ending shelling. Bizarre, very bizarre. At one point, the company is issued the new Adrian steel helmet, which replaces their cloth Kepi caps. When the war started, none of the armies issued steel helmets to their soldiers. The growing number of fatal wounds from shrapnel convinced the French army to adopt a steel helmet in 1915. The French were the first, followed by the British and the Germans. The Pickelhaube, a spiked combat helmet worn by German soldiers at the start of the war, was actually made of boiled leather, and proved to be little use against bullets and shrapnel. 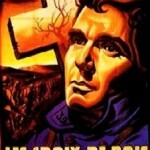 The story, or many key scenes, seems to have been taken from the French movie Wooden Crosses (1932). Yay, a love triangle. I love love triangles. It is a romance movie masquerading as a war movie. One hour into the movie and there is no battle. 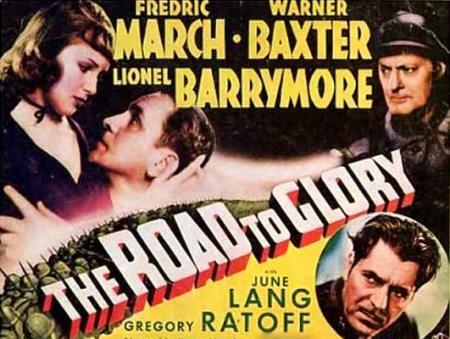 The Road to Glory is not one of the better-known WWI films, and after watching it, I understand why. The romance is dull, there is little action until the climax, and the script does little to educate viewers about the war. The movie’s sole strength is Captain LaRoche’s struggle to remain sane, greeting group after group of replacements, knowing that most of them will die in the very near future. No thanks, but I appreciate the effort. I understand. It is not worth seeing if you can avoid it.